Brother-sister team Jennifer L. Holm and Matthew Holm bring readers another wonderful book about 10-year old Sunny Lewin. 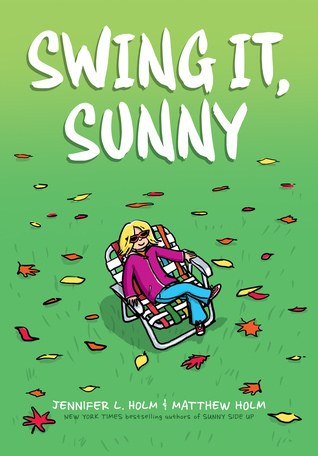 Their second graphic novel about Sunny, Swing It, Sunny, has all the elements that made Sunny Side Up engaging and endearing - warmth, humor, colorful, realistic drawings, and tackling serious topics - with a hefty dose of 70's nostalgia that adds another layer of fun! In this second book, Sunny is back home in Pennsylvania after her summer spent with Gramps in his Florida retirement community (chronicled in Sunny Side Up). She is just starting middle school, which she's finding a bit stressful, hanging out with her best friend, and is still struggling with her older brother's problems, which came to light in the first book. She has brought a new love of comics back home from Florida with her, and she and her best friend enjoy dressing up in her mom's old clothes, watching 70's sitcoms together, and keeping up with General Hospital. She misses her brother, who is away at boarding school, and looks forward to phone calls from Gramps, though it's not the same as being with him. Along the way, a new girl moves in next door, the fall/winter holidays come and go, and she looks for ways to help her brother. 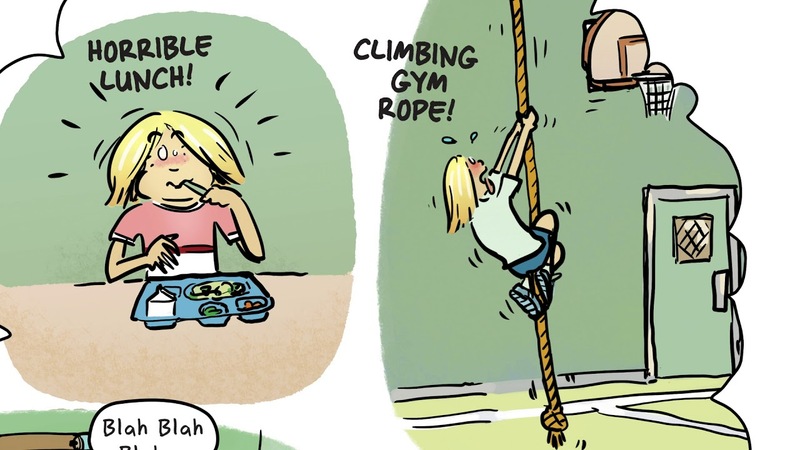 As with the first Sunny graphic novel, this one uses a fun approach and colorful drawings to depict Sunny's life but doesn't shy away from darker topics and struggles. Swing It, Sunny also integrates LOTS of story and picture portrayals of classic life in the 1970's. Everything is recreated in detail, from the clothes to the family room with shag carpeting to the TV shows. Pet rocks, Woolworth's, and pot holder making kits also make an appearance. Kids will probably find all of this funny, but I found it wonderfully nostalgic, bringing back great memories of my own childhood spent watching The Six Million Dollar Man, playing dress-up, and even the neighbor with the ever-changing array of plastic animals and yard decorations! I thoroughly enjoyed this trip down memory lane and getting to know kind, worried Sunny better as she finds her way through life's struggles and joys. 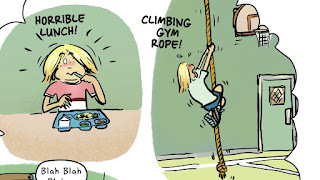 Or order Swing It, Sunny from Book Depository, with free shipping worldwide. A '70s comic sounds like it's right up my ally since I was 10 in that era. I wonder how kids today find it. My childhood, too! Lots of fun! I think kids today will find some of funny. Sign Up Now for Booktopia 2018! It's Monday 3/26! What Are You Reading? It's Monday 3/12! What Are You Reading? It's Monday 3/5! What Are You Reading?